Vasyl Lomachenko retains his WBO junior lightweight title, flooring challenger Miguel Marriaga with one second left in the seventh round en route to a technical knockout victory. Vasyl Lomachenko interacts with fans after a bout against Jason Sosa in Oxon Hill, Maryland, in this April 9, 2017, photo. 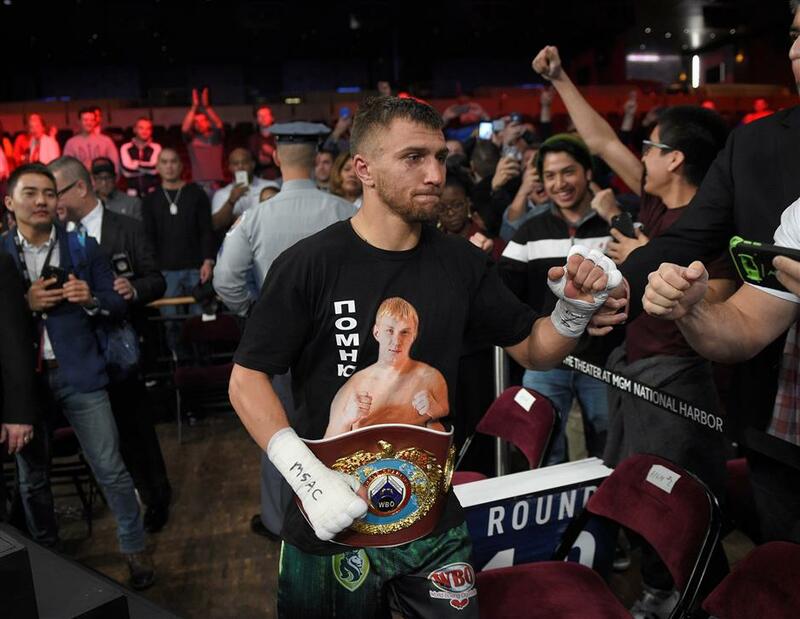 Although Vasyl Lomachenko had battered Miguel Marriaga around the ring for 6 1/2 superlative rounds, the Ukrainian star couldn't break his Colombian opponent's will until he landed a body punch that told him the end was finally near. "I hear his 'Ughhhhh,' and then I punch the body (again)," Lomachenko said with a smile. Marriaga's corner stopped the bout after seven rounds in Los Angeles on Saturday night, and Lomachenko defended his WBO 130-pound title for the third time in nine months. Lomachenko (9-1, 7 knockouts), the two-time Olympic gold medalist, showcased his virtuosic technical skill and athletic prowess in another one-sided victory. He knocked down Marriaga (25-3) in the third round and systematically took control with precise punching and graceful footwork in the ensuing rounds. Lomachenko floored Marriaga again in the waning seconds of the seventh, and the challenger's corner had finally seen enough. "It was very hard to open his defense," the Ukrainian said. "He was always looking down. I was happy when I finally got it." Ray Beltran also fought through two cuts to squeak out a majority decision over Bryan Vasquez before a lively crowd of 4,102 at the downtown Microsoft Theater. The main event was another showcase for Lomachenko, whose superior abilities have made him a favorite of knowledgeable fight fans ever since his amateur career. Given a US showcase on ESPN, he put on a show in breaking down Marriaga with skill and violence. Lomachenko started to land big shots in the second round, and he sent Marriaga sprawling backward onto the canvas with a straight left hand in the third. He also put on a show, backing into a neutral corner and confidently beckoning Marriaga toward him with a flair that recalled his similar gesture to Russian amateur world champion Albert Selimov in his dynamite first fight at the Beijing Olympics. "Unlike most fighters, he realizes that professional boxing is part sport and part entertainment," promoter Bob Arum said. "He entertains when he fights, and I think the public likes it. Who else did it like that? Muhammad Ali." A clash of heads left a cut near Lomachenko's left eye in the fourth, but the champion shrugged it off and kept slugging. He hurt Marriaga noticeably in the fifth and sixth rounds, and the Colombian finally couldn't keep his feet. "For one round, I could just see out of one eye," Lomachenko said. "Other than that, I did everything by the plan." Lomachenko became the greatest amateur boxer of his generation with a 396-1 record and gold medal victories in Beijing and London. He turned pro in 2013 and rocketed to the top, winning a 126-pound belt in his third fight in 2014. He moved up to 130 pounds in 2016 and immediately claimed a junior lightweight title. After three defenses, he could move up to lightweight soon — or he could continue to show off his skills against all comers at 130 pounds. Lomachenko was fighting for only the second time in Southern California, where he has set up training camp since turning pro. He lives and works 90 minutes west of Los Angeles in Ventura County, and his wife and children were at the Microsoft Theater to watch. Beltran (34-7-1) improved his chances to remain in the US with another victory, albeit in an occasionally monotonous fight. The 140-pound contender, whose non-immigrant visa is near expiration, survived a rough 10th round in which he took several big shots before the final bell from Costa Rica's Vasquez. "He hurt me a little," Beltran said. "Because of the cut, I couldn't see. I was a little surprised the judges had the fight so close. I only feel I lost the last round." US Olympian Mikaela Mayer won her professional debut on the undercard, stopping Widnelly Figueroa in 75 seconds.